Ah Monday. 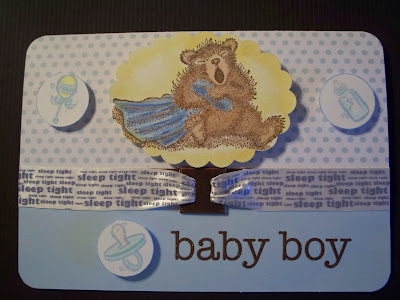 Today's card is for a new baby boy who will join our family in December. He's not done yet! Can't wait to meet him. Thanks to my friend Cathy in Arizona for the gift of the ribbon that says sleep tight, so cute. The stamp is a house mouse design. We are experiencing Indian Summer. Was nearly 60 today and they are saying it will remain like this all week. The leaves are just about done falling and are brown, red, yellow, orange and crispy. The air smells so good. We raked on Sunday and there is a big stack by the street. Hope we don't get high winds before they pick them up or our neighbors across the street will have them in their yard!